Arp is the ambient project of a Californian named Alexis Georgopoulos. That isn't really a very Californian name, in fact it sounds Greek to me. Which is funny, because the music on In Light reminds a lot of the music of the most famous Greek musician that most Americans can name. No, not Zamfir! I am referring to Vangelis, who is way more popular than Zamfir. (Brendan's Note: Really?) Really. After all, Vangelis did the song to Chariots of Fire, as well as the epic soundtrack to Blade Runner. You see, Vangelis made early electronic music on banks of synthesizers, which created a rich, lush, flowing sound. A sound that is very much in vogue -- after all, Boards of Canada have achieved widespread acclaim by trying to recreate that sound on a laptop, and then adding some beats to it. Vangelis, however, was more about the drone, the ebb and flow, and the wandering tones. Arp does the same thing. This is an LP of synthesizer riffs that flow over and into one another in cascading waves. There are no "beats" per se, but there is a definite rhythm to the pieces, often caused by an oscillating synth tone. Aside from comparing this music to Vangelis and Boards of Canada, there are some other comparisons that i can make, although these are far more specific. For example, the tune The Rising Sun is piano driven in the same way that Eluvium makes piano-driven, George Winston reminiscent music. This is a lovely song for those of us who like slow, meandering piano tunes. Fireflies on the Water, to offer another example, features synths that are often buried in tremolo in the same way that Casino vs. Japan used heavy tremolo. The synth lines positively waver in the background, almost dizzyingly. As someone who misses Casino vs. Japan, this is a very welcome tune in that it invokes the spirit, while still sounding fully unique. As a final example, Premonition for the Sculptor Steiner uses deep washes and tinkling deep tones that are a clear homage to Tangerine Dream. Heck, this song could almost have come off of Phaedra, and is the most derivative tune on the record. And that's the thing -- although i can clearly hear Vangelis, Boards of Canada, George Winston, and Casino vs. Japan referenced in this album, it is all Arp. He has taken these sounds, this style, and somehow made it his own. I can't really describe how, but i can tell when an Arp song comes on the player, and i can tell it is different from one of those other bands. To me, that is a sign of accomplishment. Arp has achieved something rather nice and unique, and that is why we listen to so many different things, isn't it? 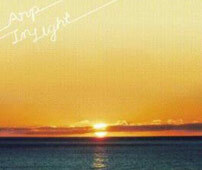 So if you like synthesizer ambient, In Light is a worthwhile investment.